Currently at the Philadelphia Museum of Art is a wonderful exhibition on the work of one of my favorite artists, Marc Chagall. 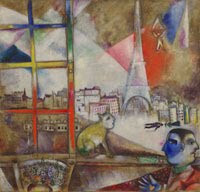 "Paris Through the Window: Marc Chagall and His Circle" is at the Perelman Building now through July 1, 2011. With over seventy works of art from Chagall himself, his teachers, and those artists with whom he surrounded himself, this exhibition allows you to see both the influence on Chagall and his influence on others. What I have always loved about Chagall's work is his ability to transport the viewer to a different world, one where the laws of physics are slightly off. His universe is filled with floating people, anthropomorphic animals, interiors on the outside, and colors that at times arrest the viewer while at others coddle and comfort. In the painting above, from which the exhibition takes its name, Chagall literally captures his first impressions of Paris. The influence of cubism which he discovered up arrival can be seen, while his use of color is drawn from his days studying in Saint Petersburg. Chagall's most important influences in Saint Petersburg, and quite possibly one of the reasons Chagall chose to journey to the City of Light. 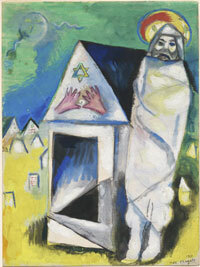 In the painting "The Pilgrim" to the left one can glimpse the palette of expressive colors that Chagall adopted to create much of his dream world. The sculpture to the right, "Sailor with Guitar" is by Jacques Lipchitz, a Lithuanian-born artist of Jewish descent who was in Paris when Chagall arrived. A friend of cubist John Gris, Lipchitz brought cubism to Chagall's world, though the Russian would never fully adopt the style. 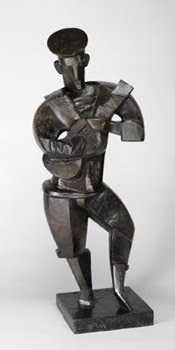 Both this statute and Lipchitz other "Woman with Braid" were two of the gems of the show. Possibly my favorite of the non-Chagall works were those by Amadeo Modigliano. While Chagall was only just beginning his time in Paris and his career as a painter, unbeknown to everyone, Modigliano was coming to the end of his. 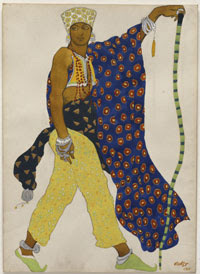 Though he would die in 1920 at the age of 36, the works he left behind are hauntingly beautiful, with a style unique and wonderful. 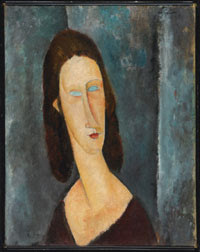 In "Blue Eyes" one sees the elongated neck and flat eyes that denote a Modigliano portrait, capturing both African sculptural portraiture and more traditional techniques. worthy of a world class museum. Maybe the best part is the fact that all of the paintings are from the museum's own collections. This is not a gathered exhibit, but rather this is the museum showing off it own wonderful holdings. Bravo! In truth, I might not have been interested in anything but the Chagalls and Modiglianos, but seeing the other in context as Chagall's circle made me appreciate them in an unexpected way. If I had any complaint at all, it was about the cell phone tour. It found that is was simply a substitute for reading the placards. Personally I am not looking for the curator to read to me what I can read for myself. Instead, I want to hear him tell me more than what I can read there on the wall or under the painting. When they did that, the cell phone tour was worth the minutes, but most often it was a waste of my time and cell minutes. Thank God I have roll over. All in all, every one in Philadelphia who cares even s little about art should see this show. And those who don't give a fig about art, maybe you need to see this more than anyone!